What is a LightSpeaker®, you say? It is a product utilizing patented AudioLight® Technology. It’s an LED light and a high-quality loudspeaker that installs like a light bulb. They are designed to fit into most 5″ and 6″ (R30 or R40) recessed lighting fixtures, or with an accessory, the LampKit, you may also use them in common lamps. This combination marks the beginning of a new category and an age where multi-room audio is accessible to anyone. 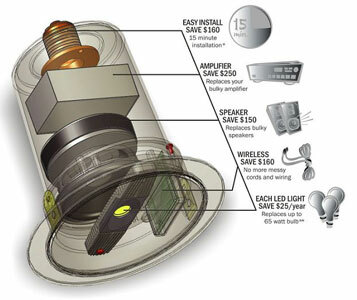 The LightSpeaker® system utilizes a proprietary 2.4 ghz wireless technology that is discreet from your home network. It is an audio network, which has proven amazingly robust. The full range driver has been customized to maximize the available air volume and benefits from digital signal processing to bring you the best possible sound from such a unique loudspeaker. The sound surprises all who listen in it’s clarity and range. Try it yourself, though, don’t take our word for it! The LED light is so efficient that is uses only 10 watts to produce light bright enough to replace up to a 65 watt bulb. This LED light may last up to 15 years, which eliminates the need to change that little rascal every few months. Sound pretty enlightening? You need look no further than the Buy Now button above to try a set out. Go on. . . have at it! We think you’ll love them!